One night last week, my daughter was struggling. She was having trouble falling asleep because she said she was thinking scary things. Now, I personally am a very vivid dreamer. I have had to be careful about what I watch, listen to and read because it eventually shows up in my dreams. This has made me even more careful with Little Bit because, well, the apple didn’t fall far from the tree. So, I was surprised by her comment and quickly reviewed in my mind’s eye what we had done for the day. Swimming with friends. Reading books on her school list. Playing with Daddy and brother in the yard. Nothing was registering. There it was. The root of it all. It wasn’t anything from her day. Nothing she’d seen or read. Nothing I missed. It was also nothing new. We’ve had this discussion before because, as a blended family, we often have to adjust to different schedules and family members leaving and returning at varying intervals. Even though she doesn’t know any different, she’s now old enough to start acknowledge how it can make her feel, whether that’s worried and uncertain or happy and excited. First, I reminded her of several things she knows: There was nothing to be afraid of, we love her always, we’re here together right now, Jesus is always with us and watching over us, and that praying would bring her comfort and help change her thoughts. Then, we talked about what things she could think about instead of being afraid: fun times on vacation, swimming, playing dolls with her friends, Daddy’s tickle fights, Legos with Brother, and reading and cuddle time with me. Most importantly, we prayed. We prayed for God’s comfort and peace to fill the room. We gave thanks for all our blessings from our warm bed to our soft, cuddly lovey. We asked for sweet dreams and quiet slumber during the night. We prayed for the angels to stand guard around us throughout the night. Little Bit is five, but I want her to know, even now, that she can be a prayer warrior. It’s such an important lesson to impart to our kids. Prayer is not just for adults. Our Heavenly Father wants us to come to him in thanks and worship, but also for heart to heart conversations. Teaching a child to be a prayer warrior is the key to raising a generation that can truly change, not only their own lives, but also the lives of those in the world around them. Maybe you’re children are struggling with their own fears, worries, and concerns. Or, maybe they’re just struggling with the actual concept of prayer and speaking to a God they cannot see. Here’s a key lesson to teach them: Prayer is just a heart to heart conversation with their best friend, the one who knows them best and is with them always. Nature Walks – Take them out and about and chat with them about all the homes, neighbors, and nature around them that they can talk to God about daily. Thankful Lists – Give them a blank sheet of paper and encourage them to draw, sketch or list all that they are thankful for: their bed, their siblings, their swing set, their house, their dog, etc. Journaling – For older kids, give them a journal book, and encourage them to write their prayers down. Write it like a letter to a pen pal or best friend, but write it to God. Reading – Find books that bring the concept of prayer to life. Our debut children’s picture book, The Bubble Who Would Not POP! by Shelly Roark weaves a unique story about God’s love in the journey of Billy Bubble and the prayer of a little girl. 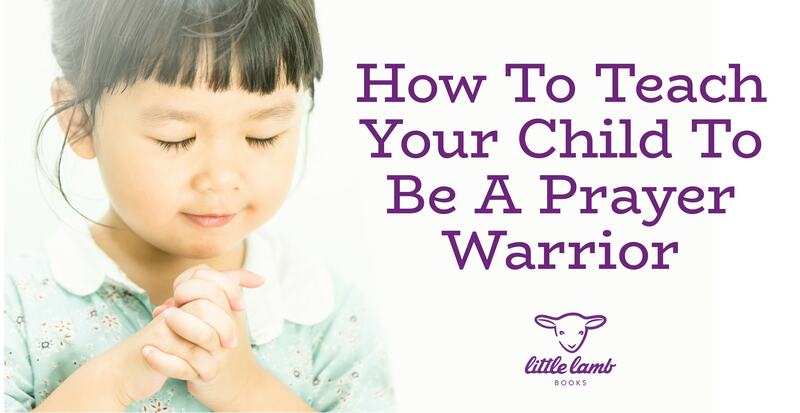 For me, the most important lesson I can teach my daughter is how to be a prayer warrior. When she prays, she is taking her battles to Jesus, who knows her and all her needs, wishes, hopes, and fears. He is always present, always listening, and always watching. What are the ways you teach your child about the power of prayer?